Today we will present Matthias Barone. He attended the 26th annual meeting of the DGK in march in Essen. In the poster session he presented his theme Ena/VASP as a possible antimetastatic target addressed Structure-optimized ProM scaffolds and was awarded with a prize. Below he will tell us about himself and his experiences. If you are interested to read more about the theme, just have a look here. 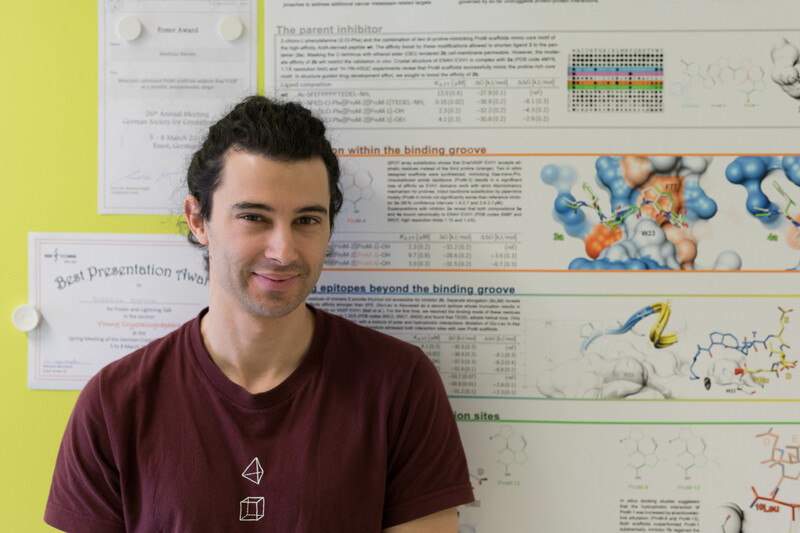 How did you end up in protein crystallography? I studied nanosciences in Basel, an interdisciplinary curriculum that facilitates working at the interfaces between biology, chemistry and physics. I love to see how nature works on the atomic level, that’s why I ended up as structural biologist. I am less interested in solving new structures, but to use crystallography as a tool to design molecules that mimic natural ligands binding to a protein surface. Tell us shortly what your poster is about. We design in silico inhibitors against Ena/VASP, a protein family involved in the polymerization of actin fibers. Synthesis of an actin meshwork at the cell membrane is the driving force behind cellular movement. Cancer cells use it to invade the surrounding tissue and metastasize into your body. Consequently, proteins involved in actin cytoskeleton assembly are discussed as antimetastatic targets. In my thesis, we used roughly 20 high-resolution crystal structures to design and optimize inhibitors against Ena/VASP as novel cancer target. This drug design process is summarized on my poster. How comes that pharmaceutical industry did not come up with that idea? Cancer therapy has largely concentrated on druggable protein kinases involved in the signaling pathways upstream of the actin-associated proteins. As there is a multitude of converging pathways, inhibition of one kinase can be overcome by activation of another pathway or downstream mutation. Such adaptations by the cancer cells lead to therapy resistance, and patients ultimately relapse and die. One way to work around therapy resistance is to target a protein even further downstream, where the interference with a drug cannot be surpassed anymore. The proteins downstream of the signaling pathways, however, are doing their job by recruiting partner proteins via flat and vast interaction sites. Such interfaces work with demanding recognition mechanisms, that turned out to be very hard to mimic with small drug-like molecules. The interactome downstream of current cancer targets is hence viewed as undruggable. What fascinates you about designing a drug? Drug design is an interdisciplinary endeavor with very different scientists working hand in hand. This dependence is a bit risky and the work-flow prone for interruptions. Only if the interfaces between structural biology, biophysics, chemistry and cell biology are working seamlessly, new molecules are being designed, brought to life, and validated. The fascination comes from the moment when you see your designed molecules actually stopping breast cancer cells from forming metastasis in a living organism! What was the biggest difficulty you faced during your thesis? Protein crystallization is far from being rational. Sometimes you are lucky, most of the time you are not. I was not for the first two years of my thesis. But lucky enough I was given a lot of freedom to experiment, and this in turn allowed to crystallize stubborn protein complexes. You got a tip for a master student? I am obsessed with the details. If you tend to have that as well, watch out during your thesis. Time flies: focus on experiments that allow to test your hypothesis. In case the outcomes collide with your hypothesis, change the hypothesis and not the experiment. A scientist I have great respect for gave me a small book to read, The Art of Scientific Storytelling from Luna. I would recommend you to read it before you start your thesis or wrap up your work. Dieser Beitrag wurde unter AK-Junge-Kristallographie abgelegt und mit meeting, people verschlagwortet. Setze ein Lesezeichen auf den Permalink.